Leading employees and teams never easy to accomplis, but when working in a foreign country some things add-up to make it even more difficult. Leadership depends a lot on culture, on personal behavior, education and social impacts. In Indonesia, management and leadership styles are strongly influenced by local culture, the cultural diversity of the country, and by the development and history of the country. This article will show you some important differences in leadership and management between Western countries and Indonesia, and will give you some advice for working with Indonesian employees and teams. In Western countries, managers strongly focus on their professional skills, whereas a strong focus on professional skills is not as important when you work in Indonesia. As a manager in Indonesia, you may have to step back a little from your professional experience and instead focus on the leadership part of your job. This means that you need highly developed communication, empathy, social integration, and pedagogic skills to succeed, rather than a master degree in engineering or rocket science. Management in Indonesia is pure people business -- and leading people in Indonesia requires that you utilize your full set of social skills. As a manager, you will not earn your staff’s respect by leading in a highly professional and efficient way or by developing solutions at the highest technical standards. What matters and counts are your personality, your character, and the way you treat your staff on a day to day basis. In general, Indonesian employees pay high respect to their superiors. If you do everything correctly, your employees will show you the utmost respect, express their politeness at any time to you, follow your requests and assignments, and will appreciate you without any prejudices. In return, your employees will expect and demand leadership and responsibility from you. Contrary to Western belief, which focuses on delivering high performances and achieving targets, Indonesian employees ask you to care about them (also on a personal level) and for you to take responsibility for their actions. You are a lot more than just the boss. You will have to take the role of a parent, coach, consultant (also in non business-related issues), and a judge. As a leader, you are the matriarch or the patriarch of your company or department. This principle applies to female and male leaders equally. You employees place high trust in you and will always show you their respect. At the same time, they expect you to give them clear and detailed assignments, advice and instructions how tasks have to be performed. They also expect you to check their work progresses frequently, take responsibility for all results and the work of the employee, and that you receive and accept the work results they have achieved (or sometimes, have not achieved). At all times, Indonesian employees expect you to be patient, wise, and to excuse mistakes. Do not be surprised when your employees count on you as an advisor or sometimes even as a judge, when they have personal issues or problems. It is not uncommon in Indonesia that managers are involved in their employees’ family issues and are asked for personal advice. Be prepared to work in a more sociable way rather than just in your professional area of expertise. Accept a certain degree of inefficiency and be flexible. For the Western mindset this may be unusual, but managers in Indonesia, will have to care a lot more personally about employees. Indonesian employees might regard you as somebody who is always right, does not make any mistakes, and always knows the right solution for any given problem. They will consider you as a highly responsible person at work and as a wise judge in critical situations, even when these critical issues are mistakes caused by the employee. Managers in Indonesia care about their employees, on a business and on a private level. In return, you will be honored and appreciated with trust and in the best case, with outstanding loyalty, as Indonesian employees develop loyalty for a person and not for a company. Once you have earned this trust, you will have people, who will follow you in good and in bad times, and sometimes even for life, even if you leave the company or the country. For an expatriate, it might be challenging to build this kind of relationship, while settling into this new role, due to a limited time in Indonesia. But if you approach this challenge in a human and organized way, and do your job well, you will gain motivated, reliable, and loyal employees for life. built on the personal engagement of the leader, and is very time consuming and work intensive. Of course, this article can't cover all the important topics and the wide range of situations a Western manager will experience in Indonesia. 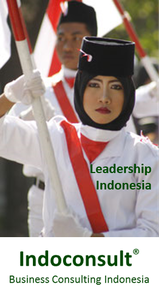 To get a deep insight into the important issues, we invite you to participate in one of our Leadership in Indonesia training, where you will learn and experience how to work and lead more effectively in Indonesia. If you are interested in individual coaching sessions about leadership, please contact us directly. We offer special coaching for leaders from leaders, so that you can reflect, improve and increase your leadership skills for Indonesia.